Plants, like animals, have properties that protect them against a variety of environmental threats. They’re the plant’s essences, or essential oils. These essences provide chemical protection against invaders like insect predators by throwing off a distinct aroma and taste.1 Humankind has found many of these plant essential oils to be aesthetically pleasing. In fact, plant aromas have been used for centuries in medicines, foods, and perfumes. 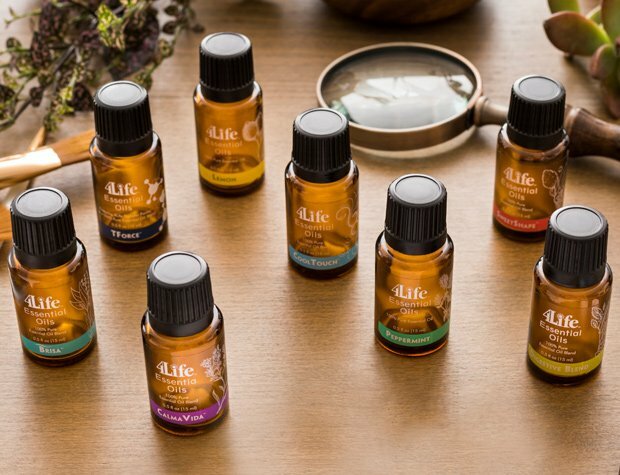 4Life Essential Oils include powerful, unique, natural, and 100% pure oils. Each oil has been carefully collected from a global supply of scientifically-documented, certified, and essential plant components to provide an optimal aesthetic experience for your body, soul, and life. Since 1998, we’ve harnessed the power of nature’s wisdom present in animals with transfer factors, powerful peptides in cow colostrum (a mother’s first milk) and chicken egg yolks, which provide foundational support for overall wellness. And now, 4Life Essential Oils harness the power of nature’s wisdom present in plants. 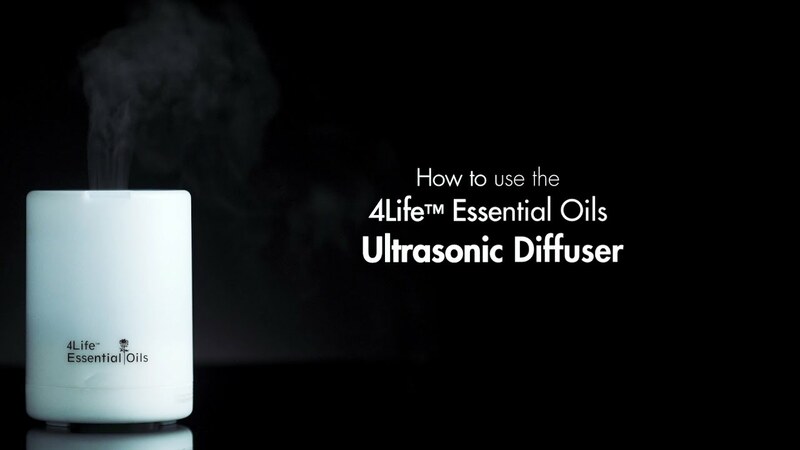 4Life has developed a proprietary scoring system to carefully screen each incoming 100% pure essential oil for the presence of precise components at their peak levels that provide the ideal experience, or aroma power. We call it the 4Life-PIQ. 4Life™ Essential Oils are compliant with the International Organization for Standardization (ISO) and Association Française de Normalissation (AFNOR). 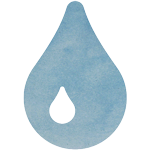 We screen for precise essential oil components at their peak levels. We use isotope, chirality, DNA, and ISO/AFNOR standard-based testing. The 4Life-PIQ represents an overall score of six to seven factors. Any score over 90 is ideal. 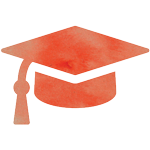 All 4Life Essential Oils have a 4Life-PIQ score that is higher than 90. Our essential oils are free from cheap fillers, carriers, synthetic fragrances, and contaminants. 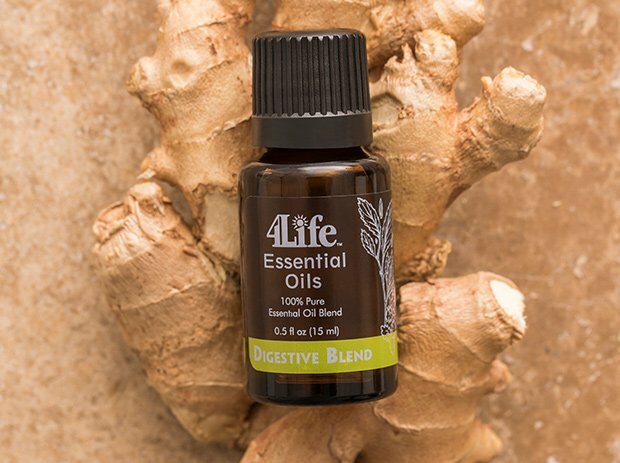 4Life Essential Oils are unadulterated—the real deal! 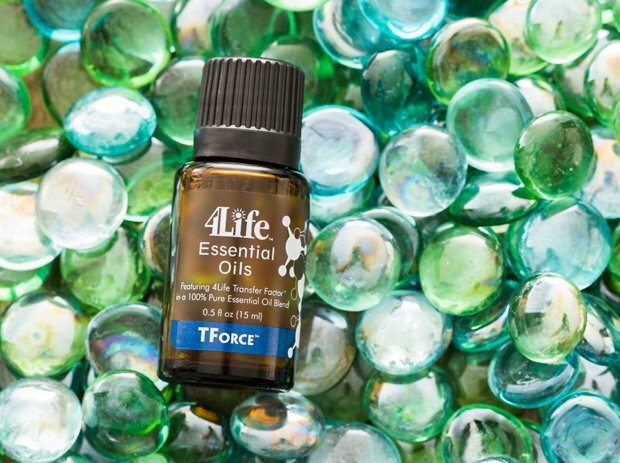 4Life™ Essential Oils TForce is the only essential oil in the world that features patented 4Life Transfer Factor™ in a 100% pure essential oil blend. This warm and welcoming essential oil can be diffused in your home. Or, blend it with a carrier oil and apply it to your skin—especially around the chest area—to receive phenomenal benefits! Origins: Orange essential oil (also referred to as sweet or wild orange) is obtained by cold-pressing the peels of Brazilian oranges (Citrus aurantium dulcis or Citrus sinensis). Patchouli essential oil is obtained from steam distillation of the leaves of the Pogostemon cablin plant, cultivated in Indonesia. Peppermint essential oil is obtained from steam distillation of the Mentha piperita plant, which is grown in the Yakima Valley of Washington, USA. Clary sage essential oil is steam distilled from aerial parts of Salvia sclarea plants from France. 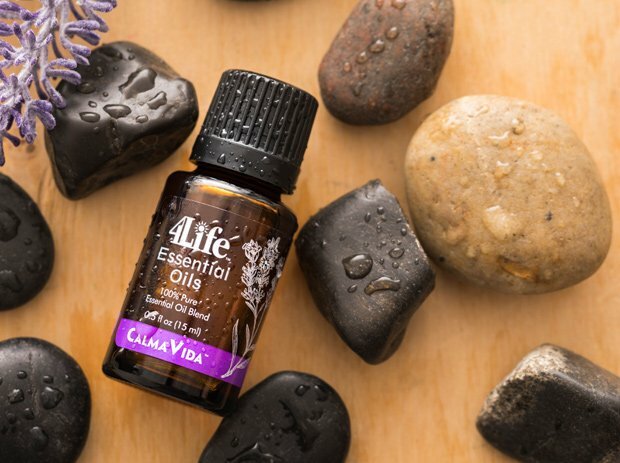 4Life™ Essential Oils CalmaVida is a 100% pure essential oil blend that bolsters the best benefits of lavender. Its aromatically bold and earthy notes impart a warm sense of tranquility to you and your environment. 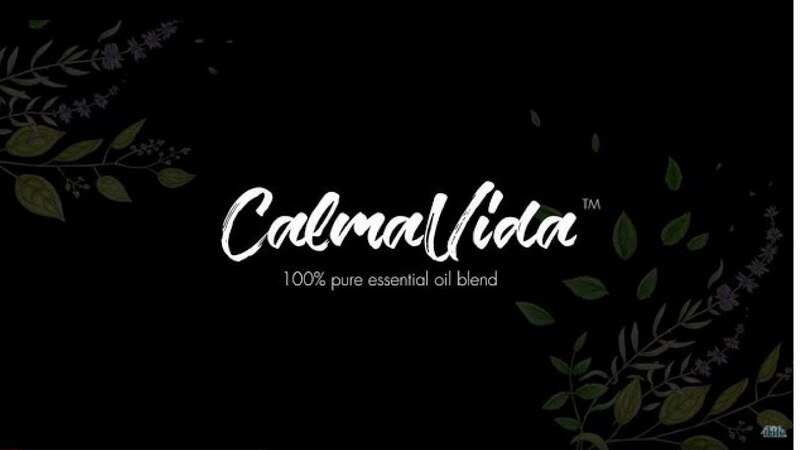 Be calm and collected in any situation with CalmaVida. Origins: CalmaVida is a blend of four essential oils to consistently achieve the ideal scent and composition. Mint essential oil is obtained by steam distillation of the Mentha citrata plant from the United States. 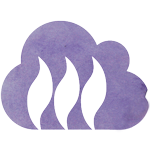 Lavender oil is produced by steam distillation of the flower heads of the Lavandula angustifolia plant from Bulgaria. Camphor white essential oil is obtained from steam distillation of the bark of the Cinnamomum camphora tree, grown in China. Lavandin essential oil is obtained from steam distillation of the flowers of the Lavandula hybrida plant from the United States. 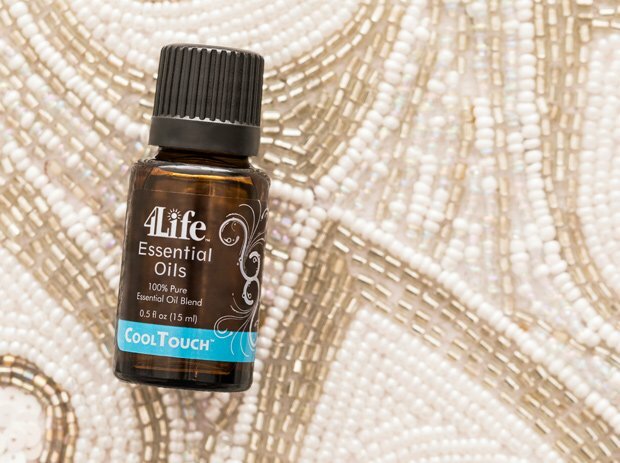 4Life™ Essential Oils CoolTouch is a 100% pure, potent, and proprietary topical blend that cools, settles, beautifies, and more! This incredibly powerful combination of plant essences creates a dynamic heating and cooling effect when used in massage. Mix CoolTouch in the Carrier Oil, and apply to the skin in a deep massaging motion for a cooling experience that will put a spring in your step, especially after a hard workout. 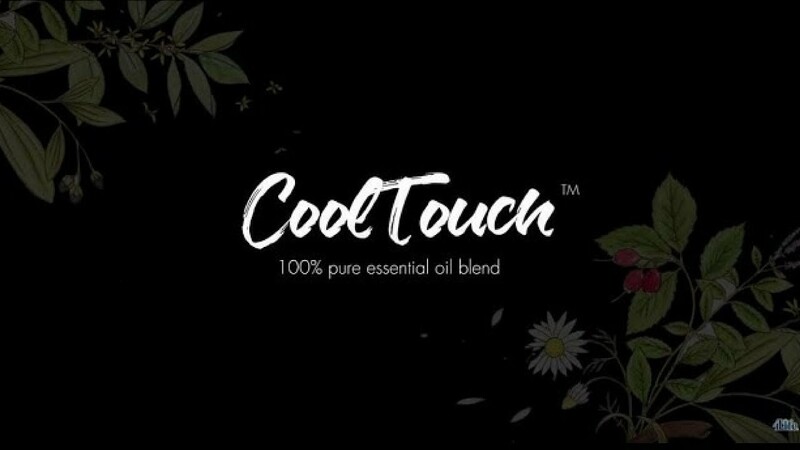 Origins: There are five essential oils in CoolTouch. Wintergreen essential oil is obtained from steam distillation of the leaves of the Gaultheria procumbens plant, grown in China. Peppermint essential oil is obtained from steam distillation of the Mentha piperita plant, grown in India. Camphor white essential oil is obtained from steam distillation of the bark of the Cinnamomum camphora tree, grown in China. Chamomile essential oil is obtained from the flowers of the Matricaria recutita plant, cultivated in Egypt. Osmanthus fragrans essential oil is obtained from the flowers grown in China. Origins: Peppermint essential oil is obtained by steam distillation of the Mentha x piperita plant from the United States. Fennel essential oil is acquired by steam distillation of Foeniculum vulgare from Hungary. Coriander essential oil is obtained by steam distillation of Coriandrum sativum fruit from Russia. Ginger essential oil is taken from Zingiber officinalis oil from Germany by CO2 extraction. Caraway essential oil comes from steam distillation of Carum carvi fruit from Holland. Tarragon essential oil is obtained by steam distillation of Artemesia dracunculus from the Middle East. Origins: Lemon essential oil is obtained by cold-pressing Citrus limon fruit grown in Argentina. Peppermint essential oil is obtained by steam distillation of the Mentha x piperita plant from the United States. 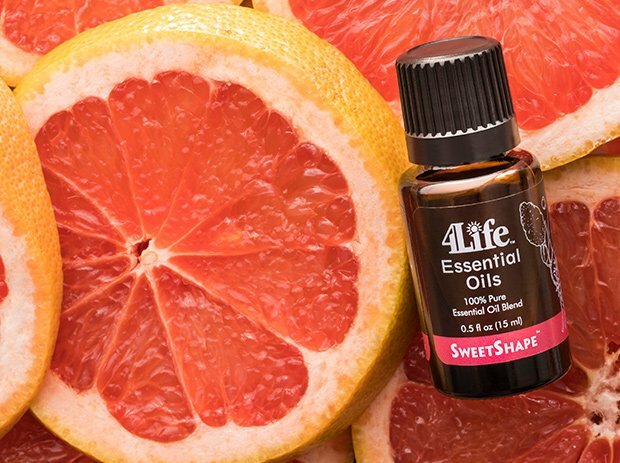 Grapefruit essential oil comes from cold-pressing Citrus paradisi fruit from the United States. Bergamot essential oil is obtained by steam distillation of Citrus bergamia from Italy. Juniper essential oil comes from steam distillation of Juniperus communis from France. Cinnamon essential oil is obtained by steam distillation of Cinnamomum zeylanicum from Sri Lanka. Ginger essential oil is taken from Zingiber officinalis from Germany by CO2 extraction. 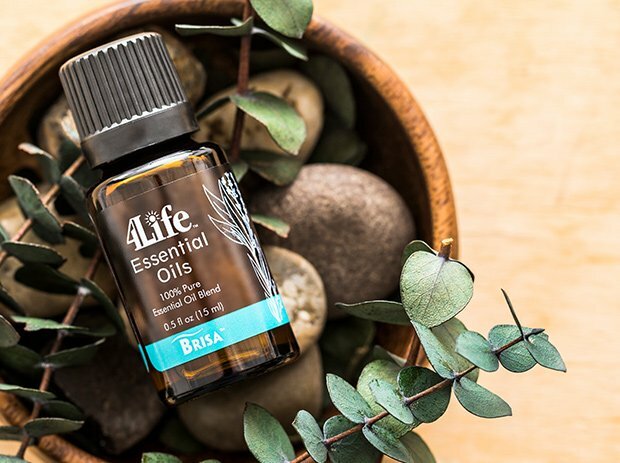 4Life™ Essential Oils Brisa is a topical blend that offers fresh air and elevated senses. It provides strong aromatic notes so you can enjoy an uplifting tonic for your lungs. Brisa combines the power of eucalyptus, peppermint, clove, thyme, frankincense, and camphor white to help elevate your senses and your outlook. Origins: Eucalyptus essential oil comes from the Eucalyptus globulus leaf from China. Peppermint essential oil is obtained from the Mentha x piperita plant from the United States. Clove essential oil is obtained from the Eugenia caryophyllus leaf from Indonesia. Thyme essential oil is taken from the Thymus vulgaris leaf from Spain. Frankincense essential oil is acquired from Boswellia carterii from Somalia. Camphor white essential oil is obtained from the bark of the Cinnamomum camphora tree from China. All of these oils are extracted by steam distillation. 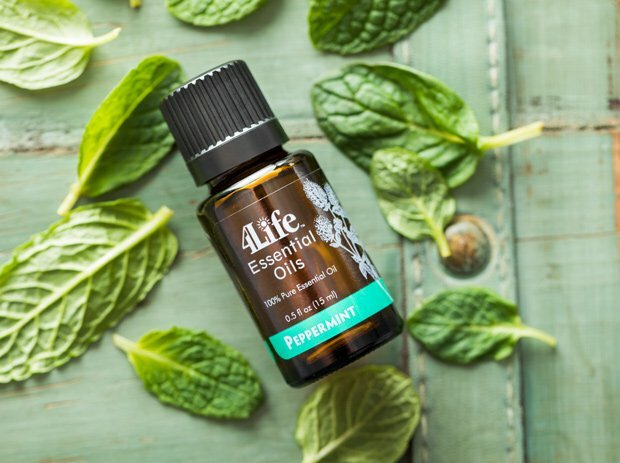 4Life™ Essential Oils Peppermint is 100% pure and proprietary, offering brisk, cool, and invigorating fragrance notes that are wonderful for diffusing. It cools and refreshes the skin and evokes feelings of freshness and peace. The fragrant top notes are simply delicious to experience, while powerful and earthy base notes make this essential oil much more than sweet. Diffuse in any environment or apply to the wrists or temples for an experience that whisks you away from real life! Origins: Peppermint is produced by steam distillation of Mentha piperita leaves grown in the Yakima Valley of Washington, USA. North American Yakima peppermint oils are widely regarded as some of the most superior peppermint oils commercially available worldwide. This oil is further redistilled for top quality scent and composition. 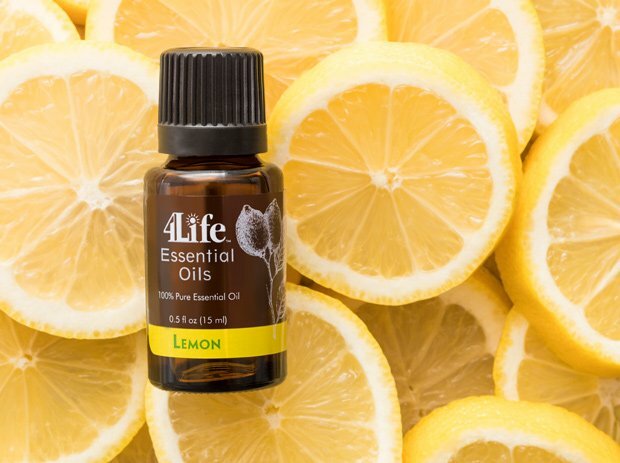 4Life™ Essential Oils Lemon is 100% pure, offering bright and vibrant top notes with a brilliantly robust base note to impart an energized attitude and fresh environment. This oil is an excellent and timeless lemon, reminiscent of Founder Bianca Lisonbee’s Italian origins. Bring elation to your mental outlook and environment with this exclusively sourced essential oil. Apply topically or diffuse. Origins: Lemon is produced by cold-pressing Citrus limon fruits grown in Argentina for the ideal scent and composition. These lemons are considered the highest quality. 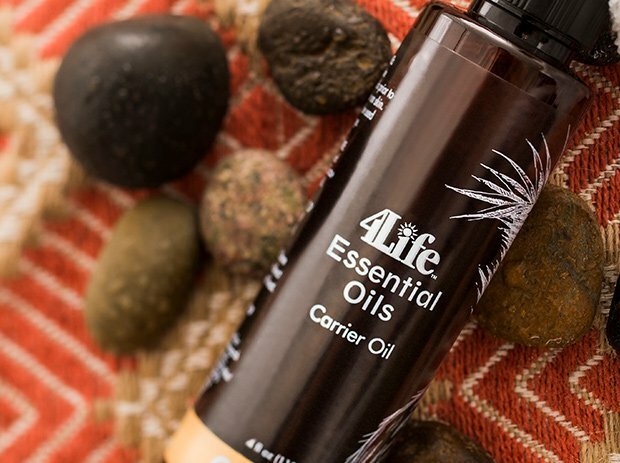 Carrier Oil is the perfect companion to 4Life Essential Oils. Its subtle coconut aroma blends beautifully with pure essential oils. Use Carrier Oil to dilute our powerful essential oils and safely carry them to the skin. It’s also great for massage. Diffuse oil into the air. Enjoy a wonderful sensory experience with diffused essential oils. Apply diluted oil onto your skin. Add diluted essential oils to your wrists, ear lobes, the sides of your neck, or even the soles of your feet. 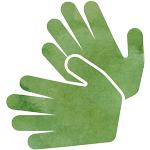 Test a small area of your skin first, to make sure you don’t have skin sensitivity. Massage diluted oil onto your body. Treat yourself or someone you love to a massage with diluted essential oils. 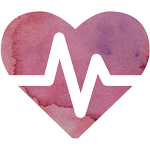 Our essential oils support your endeavors to enjoy the 4 Rs of healthy living upon which our company was founded—replenish, reinforce, rejuvenate, and reflect—for a fulfilling quality of life. 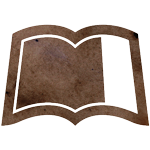 Aharoni, A. “Terpenoid Metabolism in Wild-Type and Transgenic Arabidopsis Plants.” The Plant Cell 15, no. 12 (December 2003): 2866–884. Lehrner, J., G. Marwinski, S. Lehr, P. Johren, and L. Deecke. 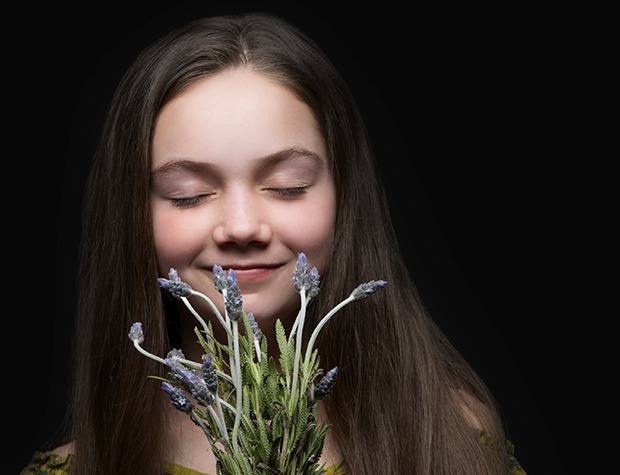 “Ambient odors of orange and lavender reduce anxiety and improve mood in a dental office.” Physiology & Behavior 86, no. 1–2 (September 2005): 92–95.